Register now for ECAO’s 2018 Industry Conference being held in Barcelona, Spain from May 26/27 to June 2, 2018. Registration fee includes hotel accommodation and conference registration, which pays for the business sessions, speakers’ fees, and some of the entertainment and meals. The website provides a complete itinerary of what’s included in the registration fee. We are in the process of finalizing the optional events, so those will be provided to you at a later date. There are a selection of sponsorship opportunities available for the ECAO Conference being held in Barcelona. A range of options to suit any marketing budget is now available! Get your brand directly in front of the decision makers that buy your products. Email cfrederickson@ecao.org today for more information. As of January 1, 2018, workers will be entitled to WSIB benefits for chronic mental stress arising out of and in the course of their employment. Workers who seek medical attention or are diagnosed as of January 1, 2018 may be entitled to benefits. Work-related chronic mental stress is any diagnosable mental disorder that has been predominantly caused by a substantial work-related stressor or series of stressors. A work-related stressor would generally be considered substantial if it is excessive in intensity and/or duration compared with the normal pressures and tensions experienced by people working in similar circumstances. For example, work-related chronic mental stress could be a mental disorder resulting from being subjected to harassment or bullying at work. the work-related stressor(s) was the predominant cause of the appropriately diagnosed mental stress injury. If you are an ECAO contractor member, please be sure to reach out to Ground to ensure your health and safety policy addresses prevention of harassment in the workplace. Also, as an ECAO contractor you have free access to TeksMed for claims management assistance. For Ground go to www.groundprogram.ca/ or email jen@groundprogram.ca and for Teksmed go to https://teksmed.com or call 1-877-850-1021. It's no secret that productivity is dipping on jobsites across the construction sector. In fact, the McKinsey Global Institute's early 2017 report, Reinventing Construction: a Route to Higher Productivity, the stats show that the global construction industry has averaged a lackluster 1% labour productivity growth annually over the past 20 years, placing it below the 2.8% growth for the total world economy. 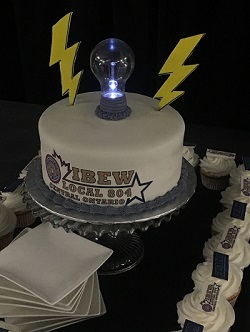 IBEW Local 804 celebrates 75 years! On October 25, IBEW Local 804 and ECACO hosted an anniversary party to celebrate Local 804’s Diamond Anniversary. It was well attended by IBEW members, representatives and retirees, as well as ECACO contractors. Numerous presentations were made to acknowledge the dedication and involvement of Local 804 members with Habitat for Humanity over the years. The evening also included highlights of IBEW/ECACO’s important contributions to helping power some of the region’s most iconic buildings. Congratulations to Local 804! Be sure to check out this new website if you haven’t yet: www.poweringcommunities.ca It showcases work that ECAO contractors have done with IBEW, and positions us as a trusted source for safe and reliable electrical work. Inspired by the results of a provincially arranged mediated session in the spring that resolved a number of rifts between trades, the Provincial Building and Construction Trades Council of Ontario is launching a new process aimed at forestalling disputes over trades' jurisdiction. Building Trades business manager Patrick Dillon explained a major aim of the process is to encourage council members to stop wasting money fighting trades disputes at the Ontario Labour Relations Board and instead to invest in building the trades up. There is still room for Affiliate Partners to get their advertising ads into the ECAO 2018 Calendar. This calendar is designed to be a handy reference tool for all electrical contractor members providing date reminders, safety tips, and contact information as well as providing an advertising opportunity for the product suppliers and service providers to ECAO members. Affiliate Partners receive a 20% discount. 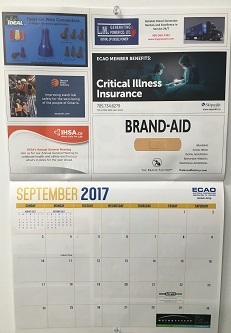 If you are interested in submitting an advertisement for our 2018 Industry Calendar, please contact Cathy at cfrederickson@ecao.org for the information package. The calendar is sent out to over 1,400 contacts. George Gritziotis took over as Registrar and CEO of the Ontario College of Trades on October 16, 2017, replacing David Tsubouchi. George is well known in the construction industry from his previous position as Ontario’s Chief Prevention Officer (CPO) under the Ministry of Labour. Gritziotis has experience working in labour management partnerships in the construction, industrial, and services sectors on human resource development issues. He’s also managed a number of national industry groups and projects on issues ranging from apprenticeship and training to labour market information. As CPO, he worked to prevent and eliminate work-related injury, illness, and fatalities and he led several strategic initiatives to improve the health and safety of Ontario workers; these included the implementation of the province’s first Integrated Occupational Health and Safety Strategy, the Mining Health, Safety and Prevention Review, mandatory health and safety awareness training, and standards for working at heights. Before joining the Ministry of Labour, George served as founding executive director of the Construction Sector Council, a national organization committed to developing a highly skilled workforce to support the human resources needs of Canada’s construction industry. He also played a key role in the establishment of the Canadian Apprenticeship Forum and the Alliance of Sector Councils and through these initiatives, he established strong working relationships with labour and business leaders. IBEW and ECAO attended a meeting with George Gritziotis and Don Gosen on Monday to discuss our concerns with OCOT, and we look forward to ongoing communication with them.